John Zawis, a 29-year veteran of the U.S. Navy, father of two and grandfather of five, spends 3-4 days a week on a Habitat job site. He is what Habitat affectionately refers to as a “regular,” a generous volunteer crew leader who manages crews weekly. John embarked on a single day home -building mission to Tijuana, Mexico this October sponsored by the Santa Ana based non-profit, Corazon. Homes are funded by sponsor organizations and families who support annual builds through donation and volunteer work. John and his volunteer crew began their day of service with an early morning caravan to the Nuevo Milenio district where they were greeted by local Corazon staff and community volunteers. 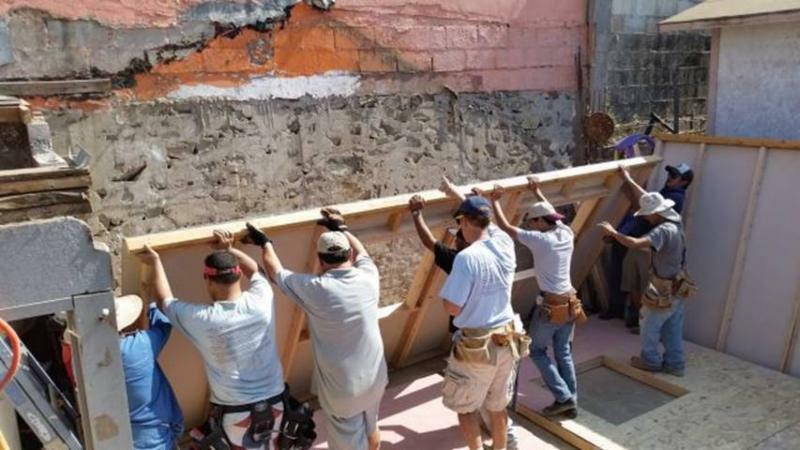 Materials were pre-staged for the build and the group of twenty-seven Americans of mixed construction skill levels formed four crews for the day. The house became a home as final touches like windows, doors, and trim were added to the constructed framework. The build was concluded by a brief ceremony in which the family received the keys to their new home and offered gratitude to all those who helped given them a home. John has proven his commitment to improving quality of life for generations to come through his work with Habitat for Humanity in San Diego, and we’re proud that he has taken that passion and care to our wonderful neighbors in Mexico. Way to go, John! See more of John’s build with Corazon!